We were delivered a moment on Sunday at Augusta National Golf Club that, quite frankly, many were convinced they would never witness again. 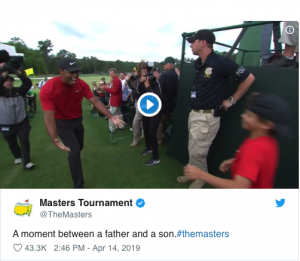 Tiger Woods claimed the 2019 Masters on Sunday, earning the fifth green jacket of his illustrious career. Woods winning another major has been doubted for so long that, naturally, patrons believed it would never take place again. Well, it did, and it was one of the most memorable moments in the history of not just golf, but sports in general. 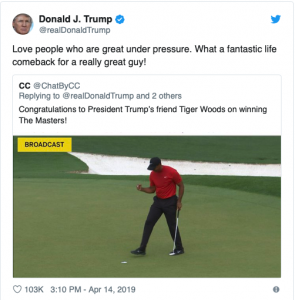 There was, of course, some historical significance that came along with Woods’ victory on Sunday at Augusta National. The 2019 Masters victory serves as the 15th major win of Tiger’s career, which now puts him just three back of the legendary Jack Nicklaus (18). Woods’ win earned him the fifth green jacket of his illustrious career, which pushes him past Arnold Palmer and leaves him just one back of Nicklaus (6).